The Proton rocket with SES-5 satellite being erected for the second time on July 7 (Credits: Roscosmos). 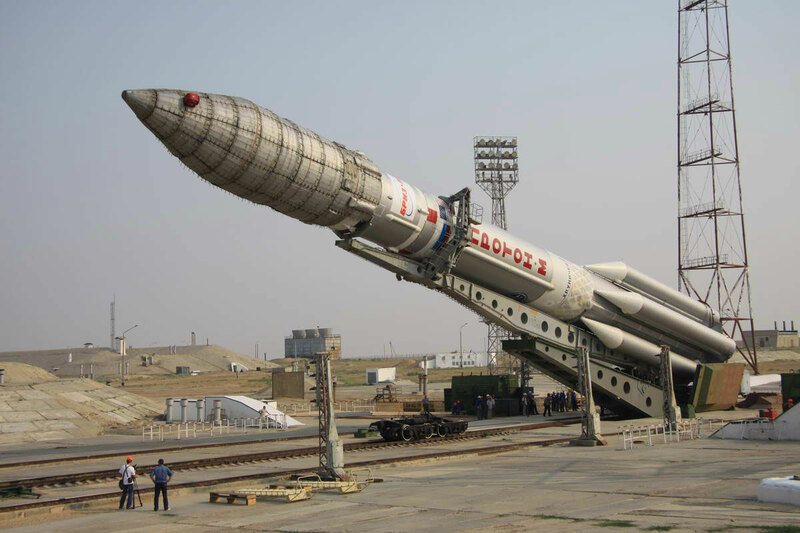 On July 9, the SES-5 communications satellite launched aboard a Proton-M rocket from Baikonur Cosmodrome. The launch had been repeatedly delayed due to a series of technical issues. SES-5 is slated to provide direct to home capacity over African, Nordic, and Baltic countries. The satellite was first scheduled for launch in December 2011. A problem with its upper stage, the same Breeze-M whose failure placed the Express-AM4 telecommunication satellite in a useless orbit in August 2011, led to a launch delay until June 2012. International Launch Services (ILS), the launch provider, reported an out of specification telemetry reading from the launch pad on June 19. Although initial attempts were made to correct the problem on the spot, the rocket had to be rolled off the launch pad and one of its hydraulic drives completely replaced. On June 29, repairs were complete and the rocket seemed ready to launch. Before it made it back out however, it was discovered that during the repairs, a technician had dropped a screw into the rocket’s oxidizer tank. Locating and removing the screw postponed the launch until July 9, when it finally took place. In addition to SES-5, the launch played host to an EGNOS payload. EGNOS, or European Geostationary Navigation Overlay Service, is an ESA and European Commission project to improve navigation positioning signals in Europe. ILS is already commissioned for the launch of SES-6. That 6 ton satellite will take off in 2013, tasked with enhancing cable coverage in North, Central, and South America. “The SES-6 satellite is significant for Latin America and the Caribbean as there is rapid growth in these areas and we expect this trend to continue,” noted Romain Bausch, president and CEO of SES.